Welcome to our website for a Boiler Service. We are the best registered gas safe engineer to do cheap boiler services. Call us now for any type of boiler service. 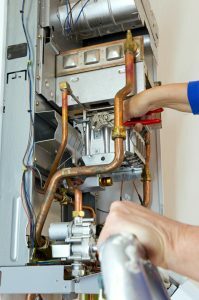 What will happen during your annual boiler service? Checks to ensure flue terminals are unobstructed and internal flue components are sealed properly. Boiler parts cleaned if necessary. Boiler casing put back on – check that properly sealed. You should receive a service report that shows everything the engineer has done to maintain your boiler. 1. Maintenance: pipework, appliances and flues must be maintained in a safe condition. Gas appliances should be serviced in accordance with the manufacturer’s instructions. If these are not available it is recommended that they are serviced annually unless advised otherwise by a Gas Safe registered engineer. 2. Gas safety checks: a 12 monthly gas safety check must be carried out on every gas appliance/flue. A gas safety check will make sure gas fittings and appliances are safe to use. 3. Record: a record of the annual gas safety check must be provided to your tenant within 28 days of the check being completed or to new tenants before they move in. Landlords must keep copies of the gas safety record for two years. Boiler Service only from £60, Call us now.